Try out an underwater adventure with all the necessary gear and a supervisor’s watchful eye! Experience fun in the sea and sun a whole new way for about an hour underwater! Includes all the necessary gear to get the full, safe experience! Master some basic concepts in the safety of shallower seawater! Use this trial activity as a gateway to being PADI Open Water Dive or certificate! Just a warning – diving is addicting! 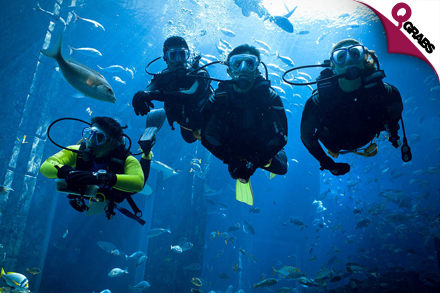 Imagine swimming alongside the fishes, exploring the bottom of the sea and breathing underwater! Sounds like an awesome adventure, and you only have to drive to Sealine to experience it! 50% off the start of a new hobby! Pearl Divers Qatar is the first 5 Star PADI Diving Center in Qatar, with PADI Diving Courses and Mares Distributor products. Car Vent Magnetic Phone & Cable Holders! Slimming Sauna Vests for Men! Portable Hanging Trash Bag Holders! Beach Body Preparation Bundle Online Course! Wall Clocks with Hidden Storage! Animal-Themed Footrest with Storage Space! Hair Products - Bleaching, Color Treatment & More! DIY Stackable Transparent Organizer Boxes! Hair Color - Roots, Highlights, Full Color & More! Vintage Leather Wallets for Women! Karate Classes for Kids & Adults! Beauty Services of Your Choice at Westbay!